← How Does a Keurig Work? Prices are out of control these days. Gasoline continues to flirt with all time highs, that 50 cent candy bar now costs a dollar, and the charge for a gallon of milk makes you think there’s gold in them there utters. And coffee is no exception. The price for a pound of bulk roasted beans is well over 10 dollars at this writing (that’s the cheap stuff) and the the more you process the coffee, the more expensive it becomes. Ground coffee costs more … oh, it might have the same price as a pound of bulk beans, but didja notice that its only 14 ounces of coffee, not a full pound? Uh-huh. And the slow rise doesn’t stop there. Instant coffee is really steep in price, with those pre-packaged paper “pods” not too far behind. Any coffee that requires grinding, forming, freeze-drying, ice-crystalling, bagging or boxing adds more pesos to the pound. And the creation of K-cups are no exception. If you’ve got the feeling that those little plastic cups are expensive, you’d be right. I’ve not actually put it on a scale or measure, but I think most coffee K-cups hold about a tablespoon to 1-1/2 tablespoons of coffee. Maybe about 14 grams by weight. Right now, I can get a 24 cup package of Caribou Blend for 16.99, or about .67 cents a cup. That means you’re dropping 67 cents for 14 grams of ground coffee. There’s 454 grams in a pound. Do some loose math and you’ll see you’re buying coffee at about the cost of 21 dollars a pound. Sure there’s the cup and the filter inside and the manufacturing cost, but still … you’re spending 21 dollars a POUND on coffee this way. That’s pretty steep. And beyond that, there’s the MORALITY of the K-cup versus Mother Earth. Save the mama, save your wallet: roll your own K-Cups! If the Keurig was a muscle car, The My K-Cup would be a factory aftermarket part. 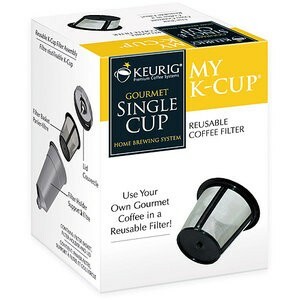 First, Keurig has the “My K-Cup” system that you can buy for about 16 dollars at the time of this writing. It replaces the snap out cup holster in your machine, holds a mesh and plastic basket and has a screw on top that mimics the hole punctured in the foil. I’ll talk about the “My K-Cup” in a coming post, but a quick “pro” is you can isolate strongly flavored coffees (think hazelnut or holiday blends) from contaminating other coffees you make afterwords. A “con” is you have to snap in and out some parts to make the thing work. 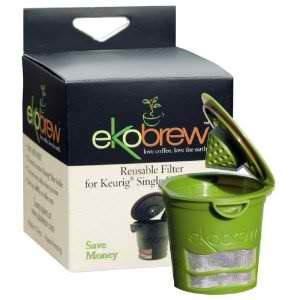 The ekobrew, for those who wish to decrease their Keurig's coffee-footprint. Then there’s the ekobrew Cup, a direct replacement for the disposable K-cup. No special holster, it behaves and handles like a regular little cup. It has a permanent cup with an attached lid and wires mesh sides. About 10 dollars, but they’ve been spotted on ebay for much less. The upside is it requires no holster change, so its easy. The downside is it tends to coat the holster in fine grounds and requires a “blank shot” of water to rinse the system. 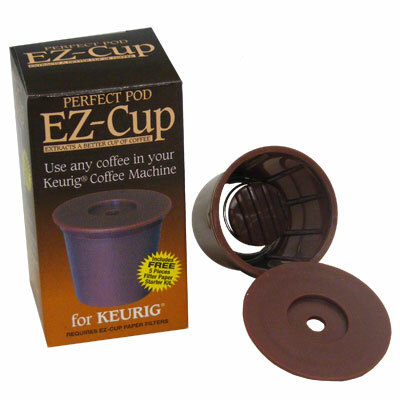 There’s the EZ-Cup, a truly roll-your-own K-cup that has disposable paper filters inserted into a solid, non-disposable plastic housing. About 14 dollars and you have to keep a supply of these little tiny paper filters. I haven’t used them, so it will have to wait for my full review. The itty-bitty paper filter does seem to be a hassle, but we’ll wait and see. I hope that bush isn't to scale, or I'm going to lose it pretty quickly! 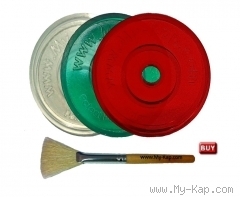 For the real recyclers among us, there’s the Kaps for K-Cups, which allow you to reuse the cup and built in filter by giving you a snap on cap that is snapped on once the punctured foil is pulled away. They even give you a little brush so you can brush the old grounds out of the filter! Yum! 3 Kaps for 10 dollars. I have tried the Keurig and the ekobrew cups. I have plans to at least try as many alternative forms of “cups” as I can stand. But I get the impression that the the first two are the most popular, so I’ll be putting together my review of these little reusables in the next few days. They all should technically save the earth from ecological destruction and stretch your coffee-addiction dollar to the max. But how do they work, and more importantly, how do they TASTE? This entry was posted in Brewing Coffee, Uncategorized and tagged coffee, ekobrew, EZ-Cup, Kaps for K-Cups, Keurig, My K-cup, reusable K-Cup. Bookmark the permalink. Can you use instant coffee in the Ekobrew? All the advertisment I’ve seen doesn’t answer this question! Richard, my feeling after using the item is NO, it isn’t designed to hold instant coffee, meaning a dried coffee designed to be dissolved in hot water. But you can simply dispense hot water directly into your drinking cup with a proper measure of instant in the bottom and stir it up. Works fine that way any any other sort of powered hot drink. I use re-usable Cafe Cups at home (They come in a 4 pack), so I fill them in the morning with my own fresh ground coffee, put them into a plastic container so they don’t dry out during the day, and have the convenience of a K-cup. Then just rinse them out at night with the few dishes I hand wash… For my trailer I use the EZ-Cup with filters, more of a hastle, but easier for clean up. I have put the filters in the Keurig single cup, but then I have to deal with the cup holster. I hate messing with the grounds in a tiny space with limited water. There are times when a K-Cup is still the best answer, but I can’t cut my decaf and regular coffee that way. And when I don’t have power? Good old teapot and gold filter single drip! Not as easy to clean up! I prefer to use plastic cups to drink. rinse them with hot water, no need to use soap. I guess plasti cups is durable and safe. As long as you are rinsing completely as soon as you’re finished and you dry the cup you should be okay! I wouldn’t leave the cup unwashed for a long time (a few hours) because bacteria can grow. doing what you can to keep plastic out of landfills or the ocean is always a worthwhile thing.